A delicious salad is undoubtedly one of my favorite meals. Switching ingredients up is one way of keeping a salad interesting. This variation of an Asian quinoa salad has just skyrocketed to the top of the list. 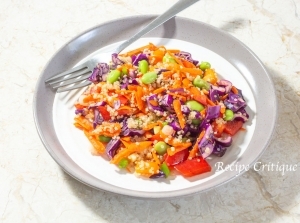 It is chock full of nutritious organic quinoa (I like Healthworks Whole Grain Quinoa because its organic and the size is good value for the money) and some of my favorite vegetables topped with an Asian sesame ginger garlic dressing that is simply to die for. And the best part is that the salad can be made in less than ten minutes start to finish if you have some precooked quinoa in the fridge. For the last several years we have all heard about the virtues of quinoa. While typically referred to as a grain, quinoa is actually a seed that was originally grown in the Andes mountain region. Long heralded as a superfood, quinoa (pronounced KEEN-Wah) is higher in nutrients than many other grains. Quinoa is a better source of fiber than brown rice. 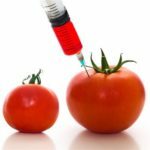 It also provides all nine of the essential amino acids are bodies are unable to make. It’s an excellent source of plant-based protein. An amazing source of vitamins, minerals and antioxidants, quinoa provides iron, magnesium, folate, copper and zinc. Additionally, quinoa is said to contribute greatly towards cardiovascular health by lowering levels of LDL cholesterol, providing monounsaturated fats and omega-3 fatty acids. Did I mention that quinoa is gluten free seed? This makes it the perfect rice substitute for people who are gluten intolerant. I eat quinoa in place of rice just because it affords more nutrition. The base of this salad is quinoa rather than lettuce, and it is topped with several incredibly healthy additions. The edamame is a good source of protein, fiber, calcium, potassium, iron, zinc, copper and magnesium. They also contain Vitamin C, B6, E and antioxidants. Edamame reportedly helps with strengthening our immune system, improved lung function, weight management, cardiovascular health and the digestive system. In addition to the edamame we have used red cabbage. According to Worlds Healthiest Foods, red cabbage provides a host of vitamins and minerals as well as antioxidants and anti-inflammatories. Red cabbage in particular is rich in anti-inflammatory compounds known as anthocyanins. Cabbage is also said to provide cardiovascular protection. 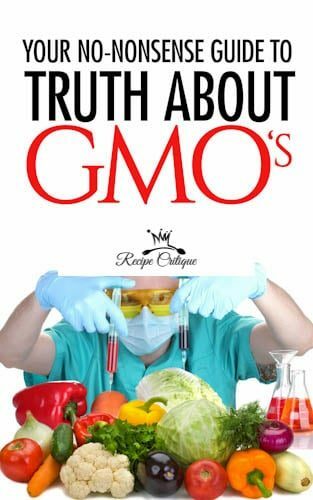 However, the trump card in cabbage is the glucosinolates that provide cancer prevention benefits against several types of cancers including prostate cancer, breast cancer, colon cancer and bladder cancer. These benefits alone are more than enough reason to up your cabbage intake. We also added some chopped bell peppers to this salad. Bell peppers, also known as capsicum annuum, are a rich source of vitamin C, B6, E, K1 and A, and healthful antioxidants. 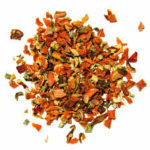 The bright red, orange and yellow varieties contain the higher levels of antioxidants and afford the sweeter flavor than the slightly more bitter green pepper. Add the quinoa, water, salt and minced garlic to a saucepan and stir to combine. Bring to a boil over high heat. Then reduce heat to low and simmer until quinoa is cooked through and water has been absorbed. 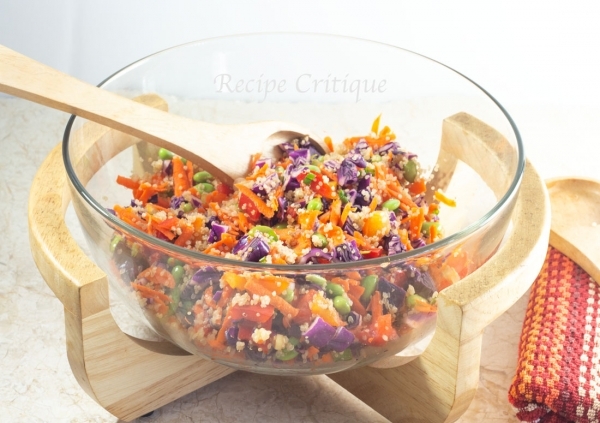 Add the cooked quinoa, edamame, carrots, bell peppers and red cabbage to a medium bowl and toss to mix. Add the sesame oil, rice vinegar, ginger, garlic clove and sesame seeds to a bowl and whisk to blend. Add the dressing to the salad mix and toss to thoroughly combine. 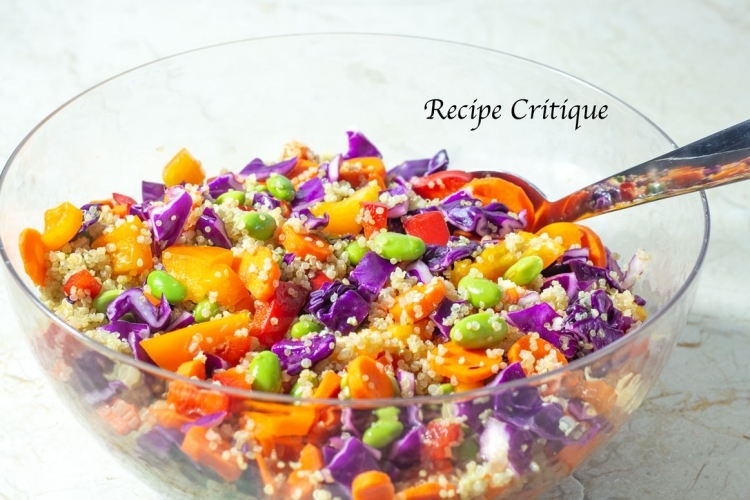 The beauty of this quinoa salad is its adaptability. Mixing in some cucumber or tomatoes or raw broccoli florets will only serve to up the nutritional benefits of consuming this salad. It easily provides a method of intake for hitting your daily fruit and vegetable goals. 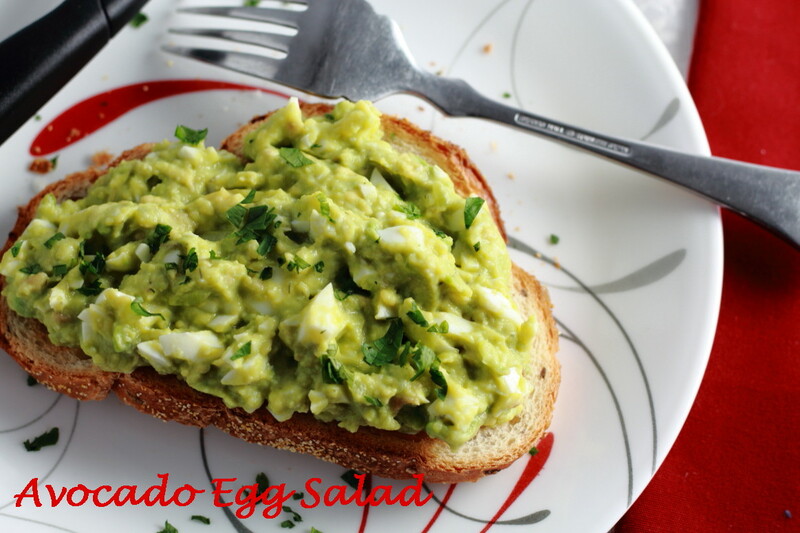 It also makes a perfect make ahead meal as it will keep in an airtight container for several days in the fridge.